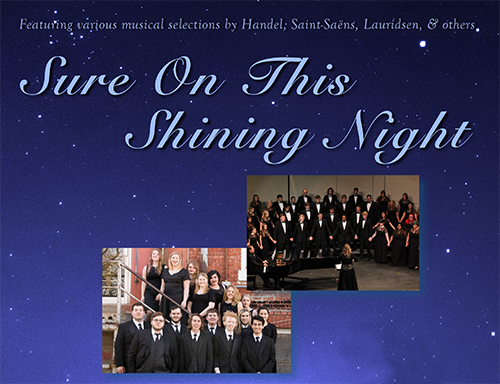 Cowley College’s Spring Choir Concert is titled "Sure On This Shining Night" featuring selections focusing on the beauty of the night. This nocturnal concert features the 50 voice Cowley Concert Choir which is bringing confidence and professional level musicality to the stage. The free performance will take place at 7 p.m. Tuesday, May 3 in the Robert Brown Theatre. The performance will feature works from the lyric melodies of the Renaissance to the dissonant contemporary time periods, joyous melodies of Handel, evening sound-scapes of Saint-Saens, and everything in between. The 15 member CC Singers will be performing more contemporary favorites including jazz favorites, Billy Joel, and Pentatonix to name a few. The concert is partnering with the Cowley County Humane Society to raise awareness for the needs of homeless and shelter animals locally and nationally. “This concert demonstrates the truly diverse talents of our singers featuring small ensembles, soloists, and the awesome power of choral music,” Marcia Wieland, director of vocal music said.